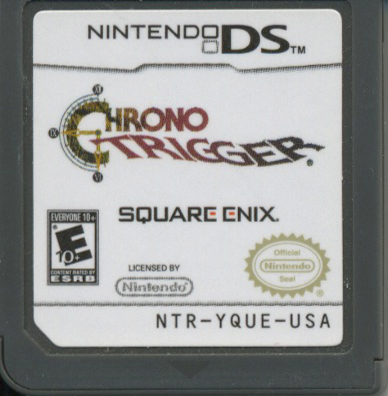 The first-run copies of the NDS iteration of Chrono Trigger are indicated by a sticker on the front of the packaged shrink wrap. These stickers indicate that they come packaged with a limited-edition poster — which is the same poster found packaged in the original Super Nintendo Entertainment System (SNES) release. Other copies released after this initial point, retracted the limited-edition poster and, as such, it is a unique artifact. Thanks to Greg Philbrook's donation, a first-run copy (which includes the limited-edition poster) of the artifact was utilized for the traversal, interview, and further examination of the NDS re-release. This complete artifact was important for the player for the purpose of reviewing game mechanics and controls, as well as gaining a more in-depth knowledge of this iteration as a whole. It was made known to the player which version this was, and the history and culture intrinsically attached to it. The box features artwork from the original SNES release of Chrono Trigger (that is also present in the form of a companion poster for both releases). Below is the publisher's logo "SQUARE ENIX" and the ESRB rating "E10+" (Everyone 10+) — which is noticeable because of the rating's distinction between the first two iterations. These ratings were "K-A" (Kids to Adults 6+) and "T" (Teen), respectively. Along the side of this box, is the NDS logo. The back liner reads: "The RPG of the Ages Returns. When a newly developed teleportation device malfunctions, young Crono must journey though time to rescue a mysterious girl from an intricate web of past and present perils. Enhanced with dual-screen presentation, stylus controls, and a host of great new features, the classic tale transcends time once again!" Two captions read: "Bonuses include brand-new dungeons and a multiplayer area," and "Timeless gameplay feels fresher than ever before!" Above each of these captions are images revealing the gameplay and dual-screen capability of the NDS. 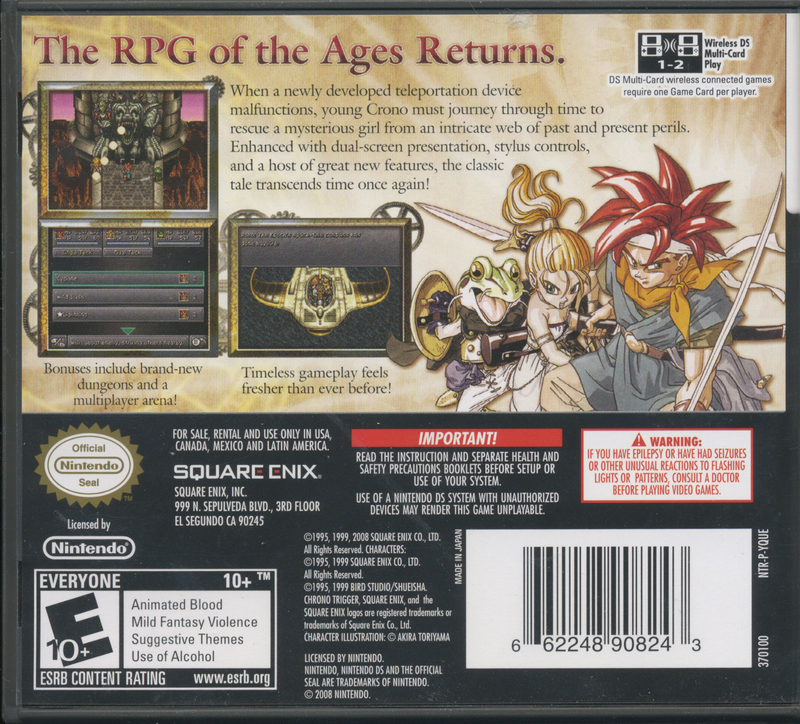 The images are, (from left to right) first a battle scene (with Ayla, Crono, and Frog) against Azala and her pet the Black Tyranno from the Prehistoric era, a scene of Marle, Lucca, and Robo in the Epoch, and lastly, artwork of Frog, Marle, and Crono is depicted. 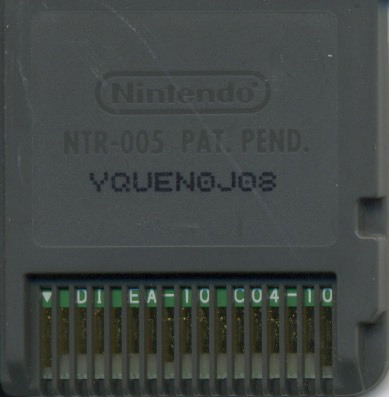 In the top right corner, an icon states that "Wireless DS Multi-Card Play" is an in-game function between two players and requires both players to own a copy of the video game. Below is an official Nintendo seal, a Nintendo logo, and a Square Enix logo. Lastly, the ESRB rating is specified further: (Everyone 10+, Animated Blood, Mild Fantasy Violence, Suggestive Themes, Use of Alcohol). The following is a standard Nintendo game card and measures at 1.4' x 1.3' x 0.2' in size with a weight of 3.5 grams. This game card reiterates information displayed on the box. The reverse of the game card is standard and blank. 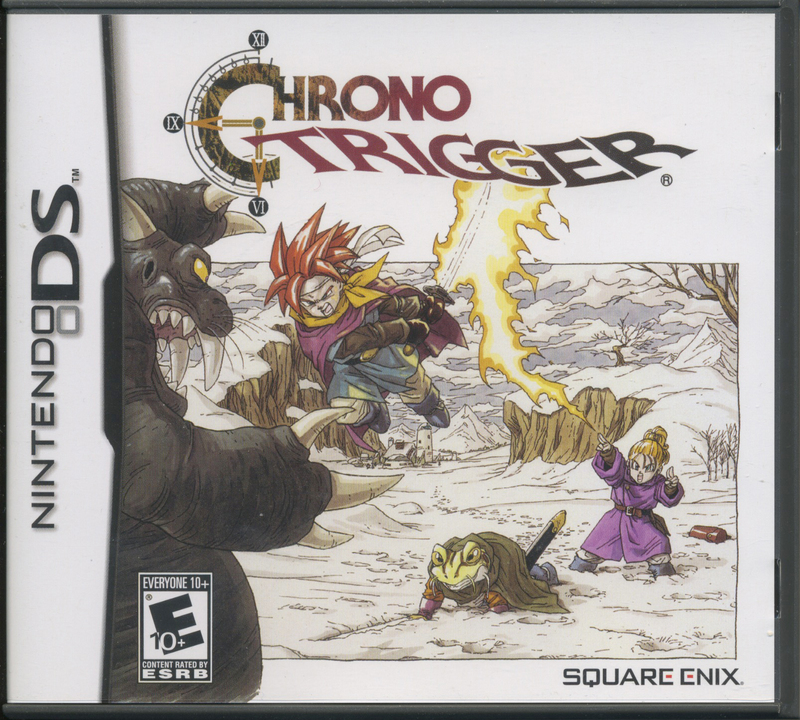 The front cover is minimal in aesthetics, much like the PlayStation (PS) re-release instruction manual — with only the Chrono Trigger title logo present amidst a white background. Similar to the NDS box, the left side of the instructional manual is embellished with the NDS logo. 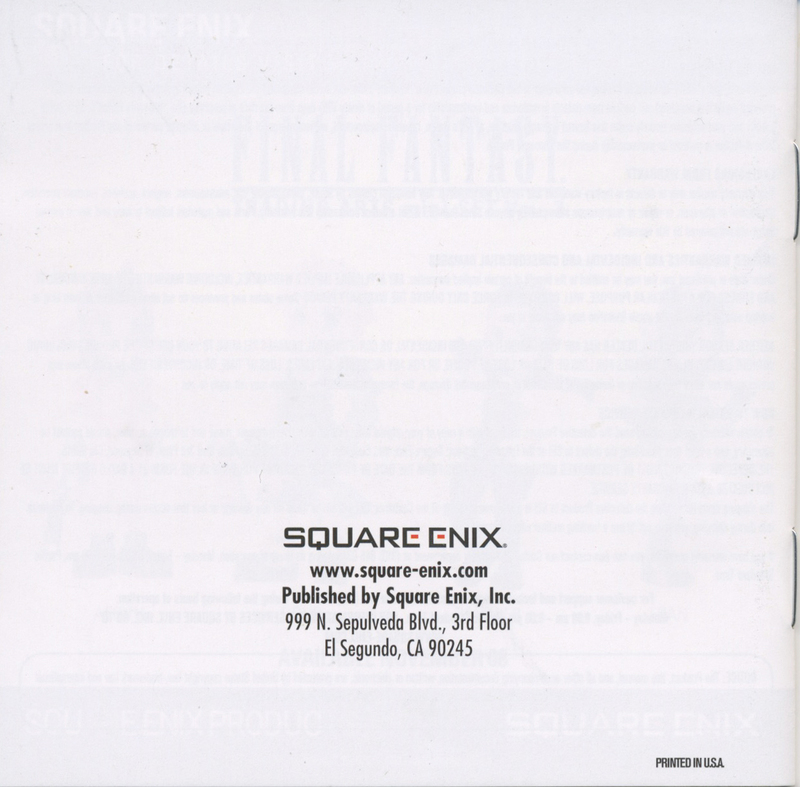 The reverse side is blank, except for the presense of detailed information pertaining to Square Enix, which reads: "SQUARE ENIX, www.square-enix.com, Published by Square Enix, Inc., 999 N. Sepulveda Blvd., 3rd Floor, El Segundo, CA 90245." 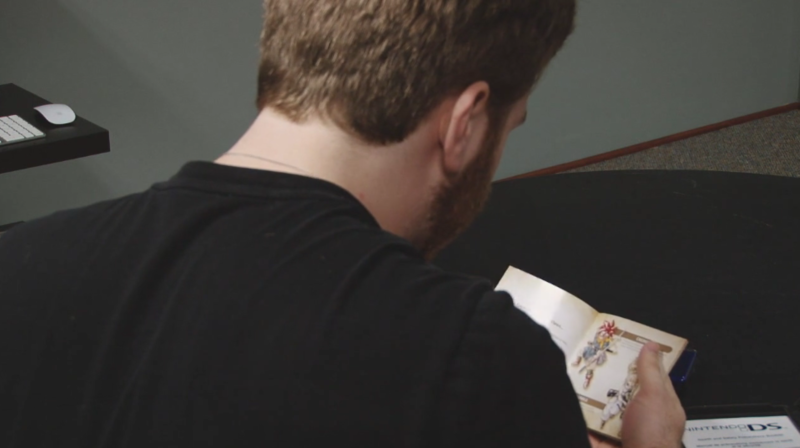 When compared to the PS and SNES booklets, this manual stays true to the original SNES guide, utilizing the same table of contents imagery and character artwork (never depicting any of the cutscenes from the PS re-release). This manual is also far more colorful and vivid than the PS booklet, in a way reflecting the same atmosphere present in the original SNES instruction booklet. Although similar to the original in these aspects, this iteration is, by far, the most vague in its descriptions of events and characters, and only mentions a few of the items and tech moves featured in the game. There is also no walkthrough segment. These trends directly coincide with the abandonment of video game hint-lines as the Internet is an even greater repository for video game knowledge. Included inside the box, in conjunction with the manual, is a complimentary poster (an exact replica of one of the poster's featured in the SNES release — which has also been displayed on the front of the NDS Chrono Trigger box). 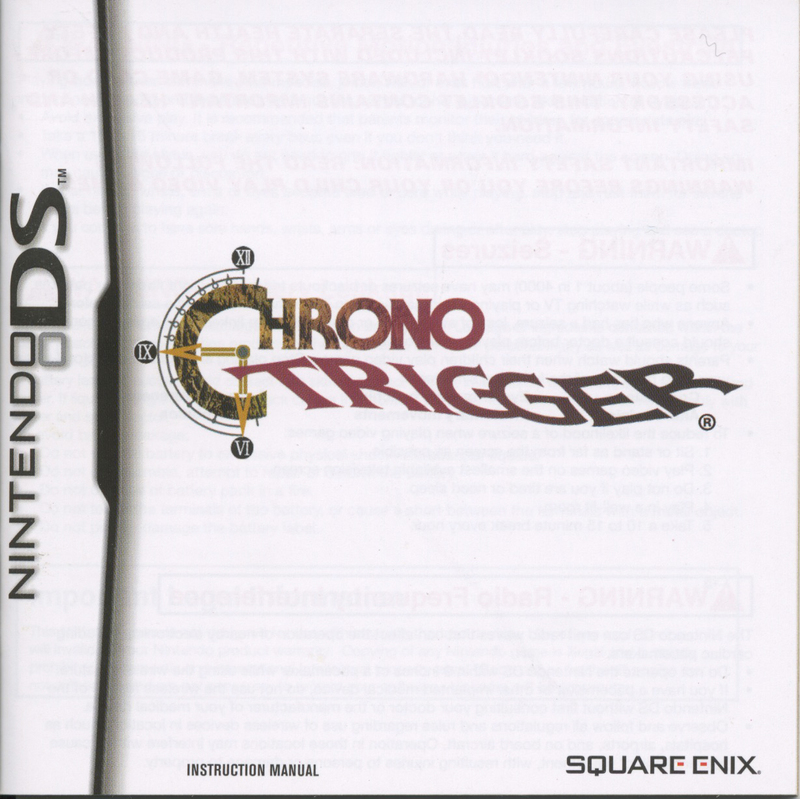 The following is a 2009 Japanese guide that was available to players at the time of Chrono Trigger's NDS re-release. A number of translations have been completed by members of the Chrono Compendium. It has been compiled in three Adobe PDF files down below. Please allow adequate time for the file to download.